Regardless of what you think of Jones or Infowars, what he is saying is correct. Don't let these companies get away with attacking the civil rights of Americans who are conservatives, Republicans, Trump voters, Christians, or simply non-socialists. China's influence over America can already be felt in the censorship emanating from Silicon Valley to the large numbers of illegal aliens flowing across our open borders. 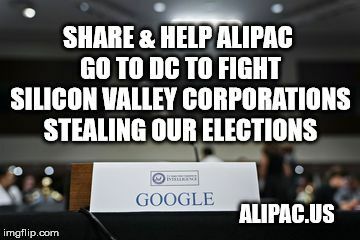 ALIPAC is leading a first of its kind lobby effort against these companies abusing their power, but we cannot speak out or fight back without your support! Please consider a donation today to fund our trip to DC to speak out for you! Last edited by ALIPAC; 09-05-2018 at 12:18 PM. "We’ve been working with governments around the world, with security experts around the world, with civic society around the world to share information about threats that we see..."